If you can’t possibly fit it in to this week’s celebration (or if you’ve already celebrated Thanksgiving or don’t plan to), well, this pie would certainly be appropriate now. Or Friday afternoon. Or seriously whenever you decide simple and delicious chocolate cream pudding pie needs to be in your life (like, yesterday, hello). 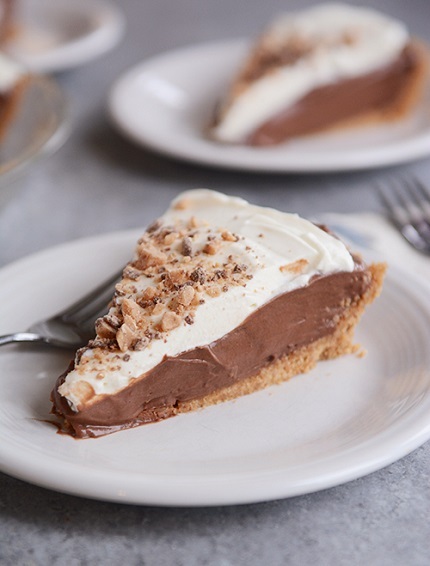 Perfect for anyone who might not want to mess with a homemade pie crust (interjecting here to say the chocolate filling would be delicious in a prebaked traditional pie shell in case that is your thing) and easy enough for most skill levels, this pudding pie is rich and creamy and deliciously chocolatey. If you are concerned about the itty bitty amount of cream cheese in the pudding layer, it doesn’t lend a cheesecake vibe to the pie — it just helps sturdy the pie up a bit and intensifies the creaminess, which contributes to the ridiculous yumminess. And now, I can rest slightly easier for sharing this. I was a tiny bit stressed that the holiday season might get away from me before I was able to alert you to the necessity of chocolate cream pudding pie. I've only ever used 2% or whole milk for this recipe. The pudding will be less thick/creamy if using lower fat milk than that. Chocolate curls, sprinkled toffee bits, dusting of cocoa powder, etc. For the crust, preheat the oven to 350 degrees F. Combine the graham cracker crumbs and sugar in a bowl. Stir in the melted butter until evenly mixed. Press the mixture in the bottom and up the sides of a 9-inch pie plate. Bake the crust for 8 minutes. Remove and let cool completely. Cover with plastic wrap until ready to use (this can be made several days in advance if kept well-covered). For the pudding layer, in a medium saucepan, whisk together the cocoa powder, brown sugar, cornstarch and salt. Add the milk and whisk to combine. Stir in the chocolate chips. Bring the mixture to a simmer over medium heat, stirring constantly. Continue to whisk as the mixture comes to a boil and large bubbles break across the surface and the mixture has thickened. Remove from the heat and stir in the vanilla extract. Scrape the pudding into a bowl and cover with plastic wrap pressed directly on the surface. Refrigerate until chilled and set up (2-3 hours). In a blender or an electric stand mixer (or with an electric hand mixer), whip the 3 ounces cream cheese, 2/3 cup cream and 1/4 cup powdered sugar together until thick and creamy. Using a rubber spatula, gently fold this mixture into the chilled chocolate pudding until combined. Evenly spread the pudding mixture into the prepared graham cracker crust. At this point you can cover with plastic wrap and refrigerate for 1-2 days (the crust will get slightly soft if it's made in advance but it is still delicious) or go ahead and top with the whipped cream mixture and refrigerate for an hour (up to 4 hours) before serving. For the whipped cream layer, whip the 1 1/2 cups heavy whipping cream and 1/4 cup powdered sugar together until soft peaks form. 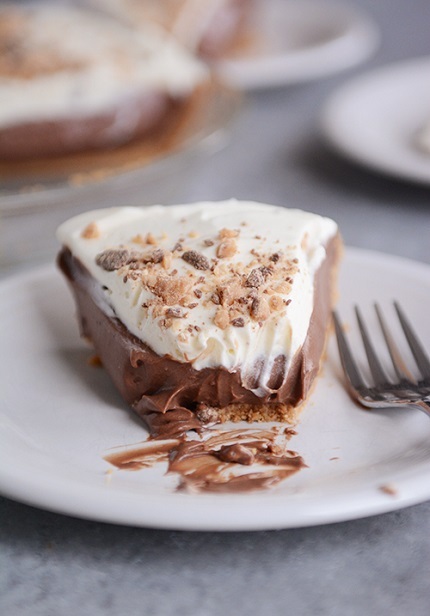 Gently spread the whipped cream over the top of the pie and garnish with chocolate curls, sprinkled toffee bits, a dusting of cocoa powder — or whatever your little heart desires. Serve chilled.